“Some of [North Korea’s] shells landed south of the border during the drill. So our military fired back north of the border in line with ordinary protocol,” a defence ministry statement said. South Korea said the two sides exchanged hundreds of shells. “The North fired some 500 shots… and some 100 of them landed in waters south of the border,” said Defence Ministry spokesman Kim Min-seok. The South fired more than 300 rounds in return, he said. Residents of a border island, Baengnyeong, were evacuated into shelters during the three-hour incident. In November 2010, North Korea fired shells at the border island of Yeonpyeong, killing two marines and two civilians. It said it was responding to South Korean military exercises in the area. Earlier that year, a South Korean warship sank near Baengnyeong island with the loss of 46 lives. 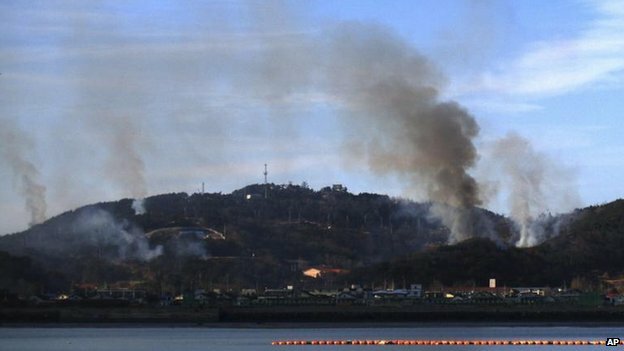 Seoul says Pyongyang torpedoed the vessel but North Korea denies any role in the incident. China – North Korea’s biggest trading partner – called for calm and restraint after the exchange of fire. It came days after North Korea test-fired two medium-range Nodong missiles over the sea, its first such launch since 2009. Late last week, the UN Security Council condemned the launch and said it was considering an “appropriate response”. That launch followed a series of short-range missile tests, seen as a response to the current US-South Korea annual military exercises. Over the weekend, North Korea also threatened to conduct a “new form” of nuclear test. It has conducted three nuclear tests to date, the most recent in February 2013. South Korea’s Unification Ministry said on Monday that there was no sign a North Korean nuclear test was imminent.